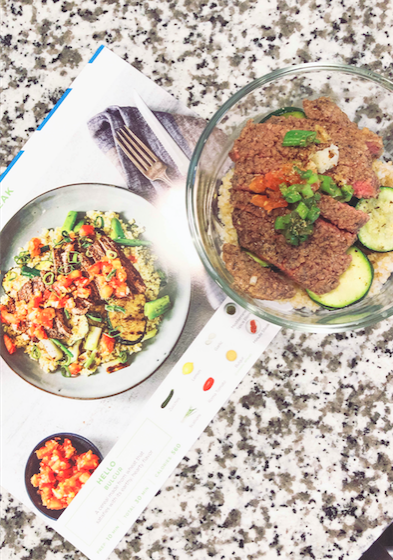 Each week there are 15 NEW Hello Fresh recipes to choose from. On a scale from 1-10 they were a 9! Very very good! The only thing I would have changed is a healthier tortilla (whole wheat & low cal) and a lower fat percentage in the beef! I've never made "pickled" anything and the pickled cucumber & radishes turned out SO GOOD! On a scale from 1-10. I rate this meal about a 6. I had the highest expectation for this meal *hint why I shot this for the blog post* and it was my least favorite. The "steak" was a round steak or something like that and very tough. I'm going to recreate this meal on my own in the future because it has all the potential. There were so many options to pick from so it was kind of hard to pick! During the week I try and eat as healthy and mindful as possible. Keeping my macros (fat, carb & protein) as spot on as I can. Then on the weekend I'm more lenient. This is really the only thing that I didn't absolutely LOVE; none of the meals were as healthy as I wanted them to be. However if healthy foods aren't your forte there are plenty of cheat worthy meals! Three cheese Alfredo, Fried Tilapia Sandwiches, and Gouda Pork Burgers to name a few. I love how you can tailor each meal to fit you. When selecting a meal you can filter through cook time, regular & vegetarian options, allergen free options: such a nut, gluten & dairy free. I scheduled my food to arrive on Saturday so that on Sunday I could prep one to eat for dinner sunday night and lunch on Monday. It made two portions. Here are a few other things I loved about Hello Fresh. VII. The ability to pick when an order will be delivered. All in all I really enjoyed my go with Hellofresh last week. I enjoyed the taco recipe and the convince of not having to grocery shop for as much. The portions were also spot on. However, I did find a small con to it. In the life stage I'm in right now (full time college kid with two jobs) I find it most convenient for me to cook two, four portion meals on Sunday afternoons to eat for the rest of the week. a. I only have to make and clean up one mess. b. I have lunch and dinner prepped for an entire week. I've found meal prepping four servings of two different meals really helps me be more time efficient during the week. This is just my personal preference. Next time I order a hello fresh box I will order bigger portions so I can meal prep it on Sunday for the week or order a more delicious & hardier meal to cook for Connor and I for the weekend! You should give it a go and see what you think! CLICK HERE FOR $40 OFF YOUR FIRST ORDER! Legit, you can can your first box of meals for under $10 no strings attached. I hope you enjoyed my take on HelloFresh & you try it just to see what your thoughts are! If you do be sure and use this $40 off coupon & let me know what you think!